1. Application begins on April 17, 2018. Submission of application as well as code ends at 23:59 (GMT+8) on May 20, 2018. 2. Developers can apply and participate individually or in team. 3. Each team/individual participant can sign up for 5 sub-contests. For files of relevant code and technological support please refer to: https://github.com/tronprotocol. 5. The freedom belongs to developers to exchange ideas or to team up in Tron community. The recommended platform is the official Slack of Tron, https://tronfoundation.slack.com/. 6. Please submit your project from April 17-May 20, 2018. Failure to make your submission is regarded as voluntary withdrawal from the contest. 7. Submitted work must include an executable program and code. The reward pool is $1,000,000. First-place prizes are set for the designers of the three applications. Reward will be delivered within 1 month to the announcement. 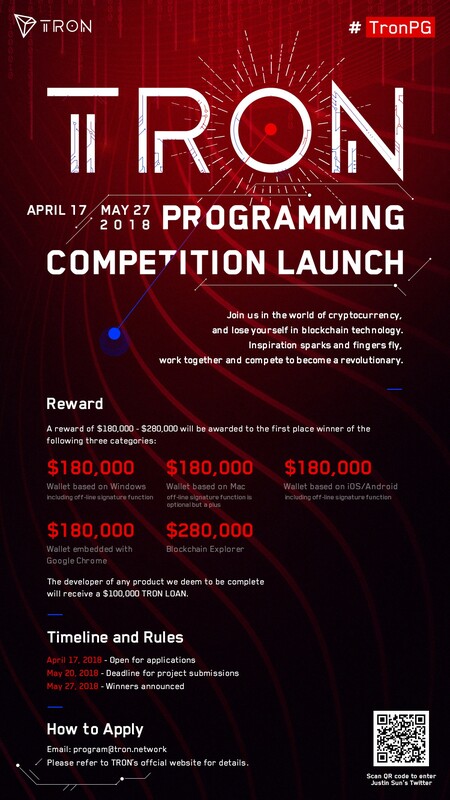 Please refer to Tron’s official website for details.